All Dryer Internals, product process area is in 316 / 316L, stainless steel construction, mirror polish. Sturdy welded external chamber reinforcement ensures maximum operating protection and dependability under full vacuum operation. Hollow pad type heating shelves baffled for essential heat transfer. All shelf-to-manifold connectors are located outside the dryer chamber, to preclude product contamination. Validation ports and nitrogen purge nozzles provided. 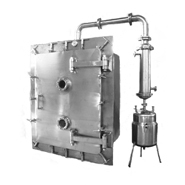 Fluid heating and circulating systems provided either steam or electrically heated. Vapor condensation unit along with a receiver for solvent recovery. Integrated Vacuum pump system provided to match custom requirements. CIP (Cleaning In Place) system can be provided. Full validation services available including DQ,IQ/OQ, FAT / SAT protocols. 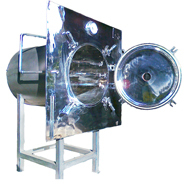 Circular and rectangular Drying systems ideal for small to moderate levels of production. Load cell system integration for lab models. Note: Tray height can be elevated to a maximum of 50mm from above type Center to center distance between any two shelves/ heating plate is 100mm.